I love receiving mail! I ogle over the Pottery Barn catalogs, shake my head at the quantity and quality of political advertisements, and I used to open up almost every single Publishers Clearing House envelope. The envelopes quite clearly stated that I was a “selected winner” and commanded “final steps were required” to take. How could I argue and what did I have to lose? For four months, with delusional hopes of winning, I painstakingly stuck every sticker/stamp in the correct place of the catalog all while avoiding household duties and screaming children. After the finalist papers had been mailed in, the house was still a mess, the kids were still screaming and no Prize Patrol, balloons, or an oversized check came to my door. But the other day, a beautiful, handwritten note of encouragement arrived in my mailbox. The real mailbox. The one located in front of my house on the side of the street. The envelope did not proclaim that I was a “selected winner.”There were no blaring, red words stating “final steps required” on the front. No stickers to be stuck, no catalog to go through, no other mailings required. Yet, I knew that this letter represented that I was a winner and a prize worth more than money was waiting for me within the words the note contained. The card was sent from a dear friend (and mentor.) A friend whom I can depend on and who I trust with my deepest fears and insecurities. A friend who laughs with me, celebrates with me, mourns with me, prays with me and for me. But best of all, this friend allows me to be me. She loves me for who I am. The good and the work-in-progress. If you have a friend like that, consider yourself an ultimate winner! There is something liberating and powerful, so divine in a friendship like that. And I am so blessed to have more than one friendship like that. I did not wait to get into the house but opened the card in the driveway. Each word I read, sunk into my heart. It was a card about me. All the good things that my friend noticed in me. Leadership skills, vulnerability, faith, and friendship. She called them out one by one in careful, thoughtful, and encouraging way. Have you ever received a letter like that? It is life giving. The envelope did not state there were “final steps required,” but there were final steps that I wanted to take. 1.) I praised God for the blessing of friendship and the encouragement of others. If you do not have friends in your life, why not pray about it. Ask the Lord to put some people in your path that will be a blessing to you. 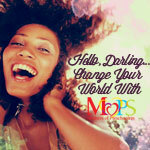 If you a mom, a MOPS group is a great place to find some friends. 2.) Be an encourager! Each week, one of my goals is to write at least two letters/cards of encouragement to friends and family. It doesn’t need to be a long letter. Just a note to let them know that I am thinking of them, praying for them, and to call out something good that I see or admire in them. And then pray that the letter arrives at just the right moment. Make someone a “winner” today. Mail a “prize winning” envelope today that includes a prize worth more than money. A prize of encouraging words that bless their day. PS….One final note on Publishers Clearing House, if you happen to be curious, purchasing something (let’s say three super sharp, never dulling, crystallized scissors and two amazing, can’t-find-them-anywhere-else-yes-you-really-can pencil sharpeners) from the PCH catalog, that really, REALLY does not give you a better chance of winning (exactly as the fine print says.) JUST SAYING! This entry was posted in EMBRACE Growth and tagged encouragement, friend, friendship, handwritten letters, mail, MOPS, notice goodness, prize letter, publishers clearing house, winner. Bookmark the permalink. I received one such letter in my mailbox yesterday and it meant so much to me. I love the idea of passing the love along to others by personal, uplifting mail. Thanks for your comment, Camie! What a wonderful idea. I’ll get my notecards ready. We should all come into this world with a friend such as yours.